Mobile Devices in Sacrament Meeting? Given the potential blessings—as well as the potential distractions—of these digital devices, how do members decide when to use them in church, especially in sacrament meeting? 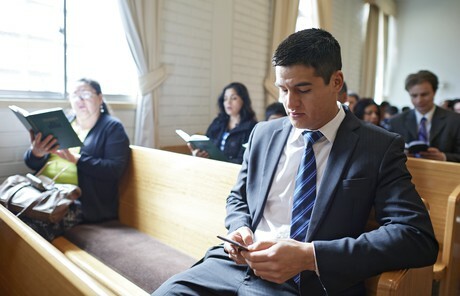 The article “Worshipping in a Digital Age” in the August Ensign examines principles that may be helpful in making decisions about using mobile devices in sacrament meeting. If I had it my way I would gain access to every router in the LDS Access network and enable MAC filtering and block my bratty step-daughters MAC ID. Today’s teenagers can’t handle it. This is like electronic cocaine to them. In my opinion, the church isn’t doing anyone any favors by providing WiFi in every meetinghouse and temple. The other side to this argument puts it on the parents to simply take away phones. The problem is too many parents are idiots when it comes to this. Control your brat who is disruptive to the rest of the class. I am in a mixed family and my wife won’t take the phone away so I have a restriction set up to kill all cellular communications during the block. This is where the church unknowingly circumvents my efforts (and many others I’m sure) by providing WiFi. It is my argument that LDS Access perpetuates more problems than it does good. All us adults who need to show a short video should just use our own data. My husband set up my son’s phone so it turns off during church and school hours. He has no access during school and church hours. I thought this was a good, well-balanced article that covered a lot of important points. One of the kids in my Primary class noticed a less active kid who had come did not know the words to the Primary songs. He took his phone and looked up the words to share with the kid so he could sing along. The Primary chorister got upset that children were looking at their phones during singing time. We have got to get better in trusting that people will use the technology for good. Yes there are those that will abuse and use inappropriately and we need to help them but we can’t assume that all use is bad and evil.